D’Grease It No 2 is a water based degreaser for quick and efficient degreasing and general cleaning in industrial, automotive and marine use. It swiftly removes stubborn oils greases and soils from engines, metal parts, tools, driveways, walls, trucks and trailers. Can be used neat or diluted with water. 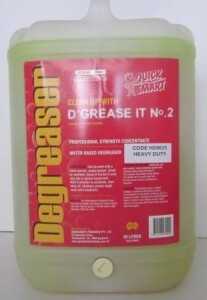 Spray it onto any oily or greasy equipment. 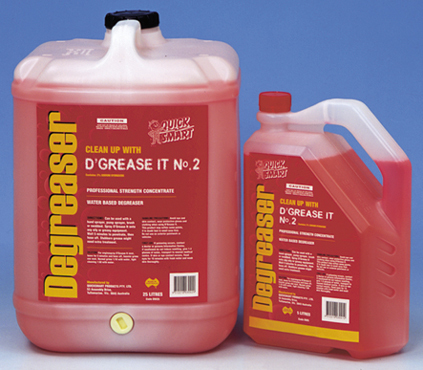 Our heavy duty water based degreaser is a powerful, heavy duty cleaner and degreaser specially formulated for industrial strength applications. Caution : Will remove paint. Only use in heavy duty applications.